One of my life’s ambitions is to travel to far-away countries, see exotic animals, and eat them. (Well, at least if you can find them in your local supermarket or restaurant…) It was therefore only logical that I would try to make some ‘roo (or “Kangaroo”) while in Australia. And this is what I did. The first order of the day was to go to one of said local supermarkets to score some ‘roo. 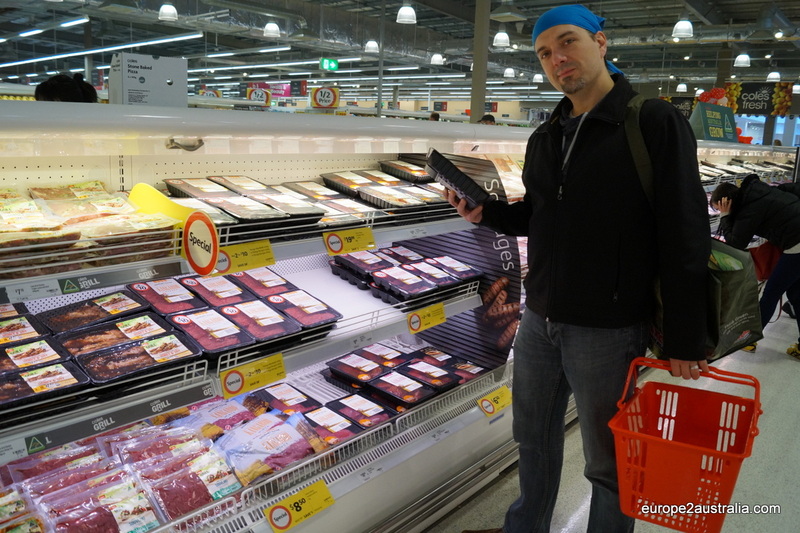 Turns out, while Kangaroo is eaten here, it has far less shelve space than more traditional meats (there was about 1.5 meters of shelving space reserved to it, while pork, for example, had about 10m). 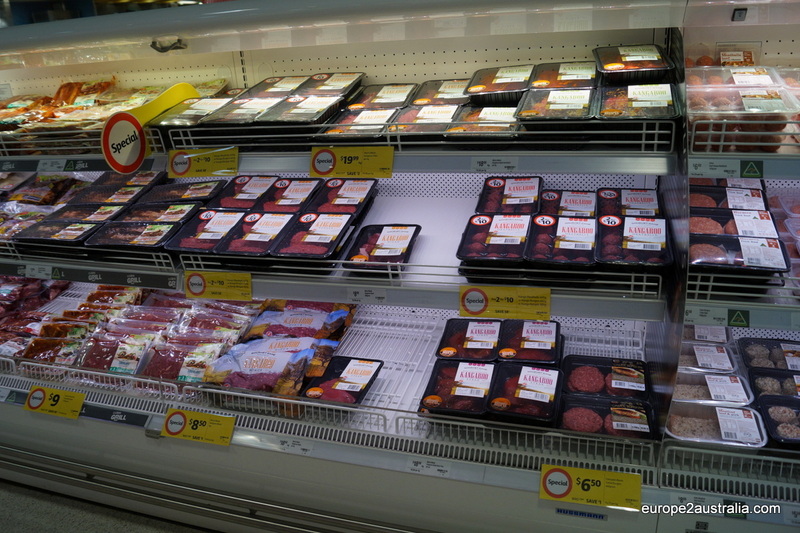 But at least there is a bit of variety, with ‘roo sausages, ‘roo minced meat, ‘roo meatballs and ‘roo steak. One kilo of steak should do nicely. With that taken care of, it was time to get cooking. 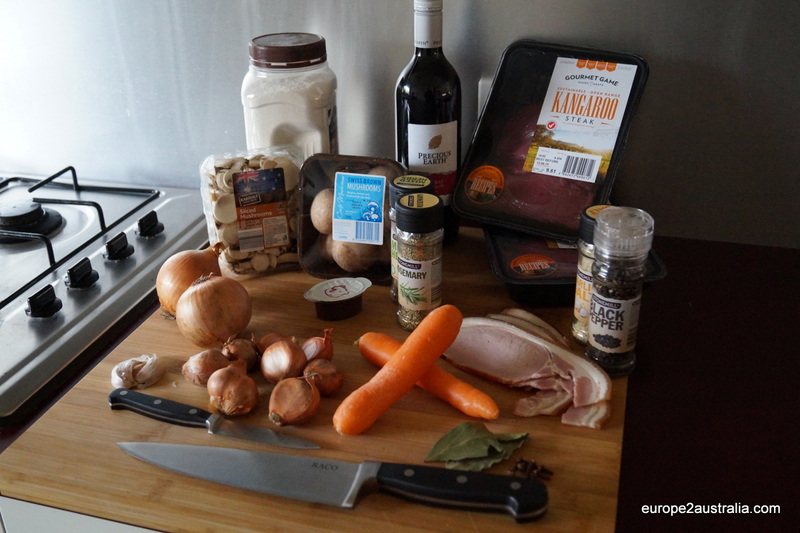 And as it is winter here, the choice of dish was easy: I would adapt a tried-and-tested recepie for stew and substitute the beef for Kangaroo meat. Sounded like a good plan. We have all the ingredients that we need. Check. 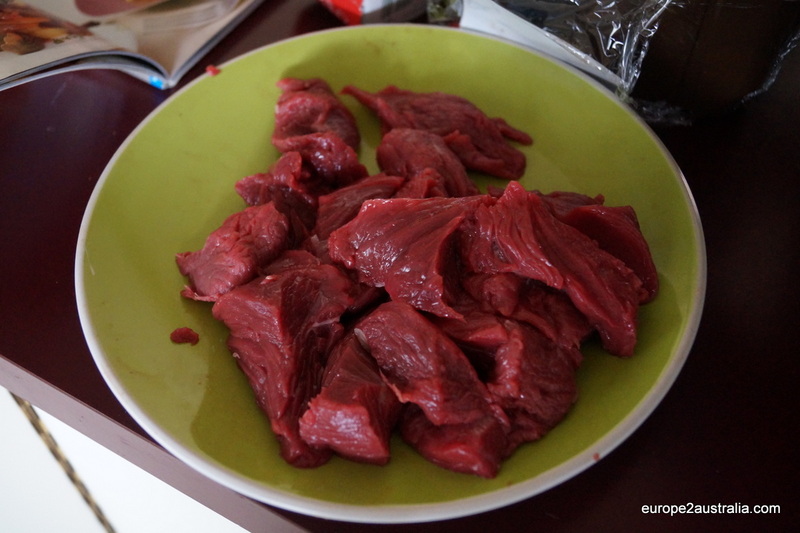 Chop up the ‘roo meat into cubes about 2cm to the side. Fry in several batches until brown and put them in a bigger pot. The fry bacon, mushrooms and shalotts and put to the side. 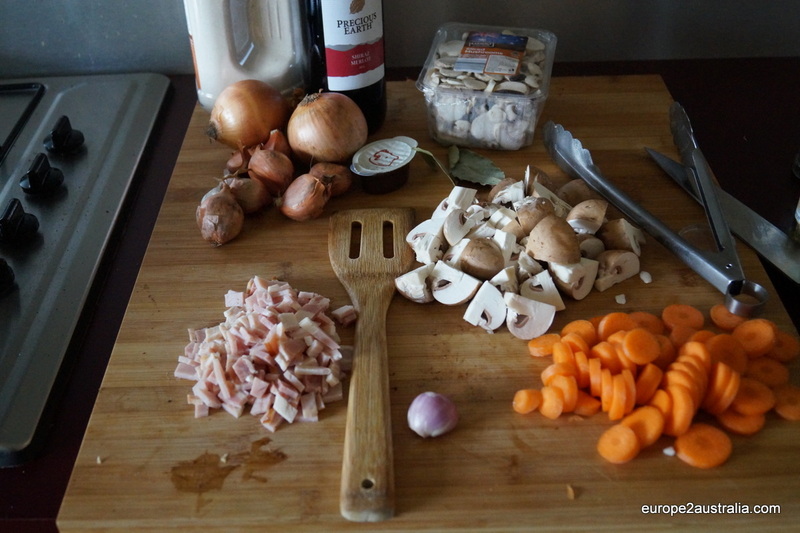 Fry onions and carrots, add some flour and add to the meat. Add wine, stock and herbs and let simmer for three to four hours. 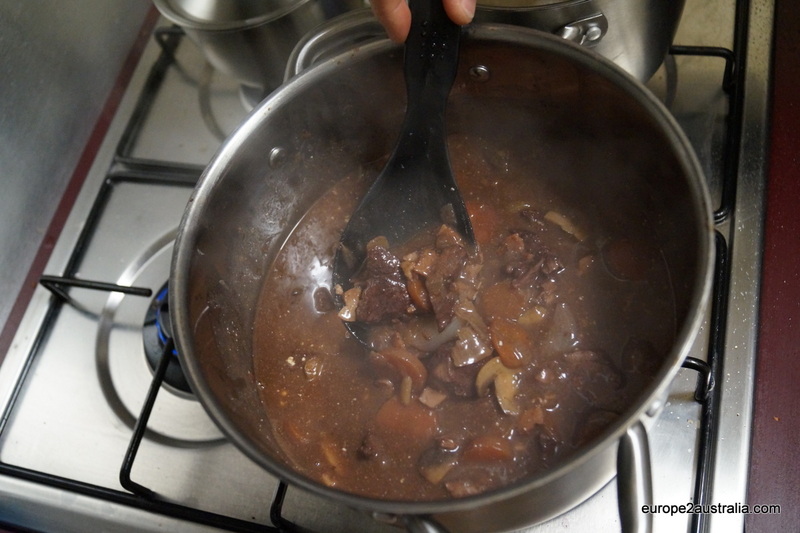 Add the mushroom mix and let stew for another half an hour. 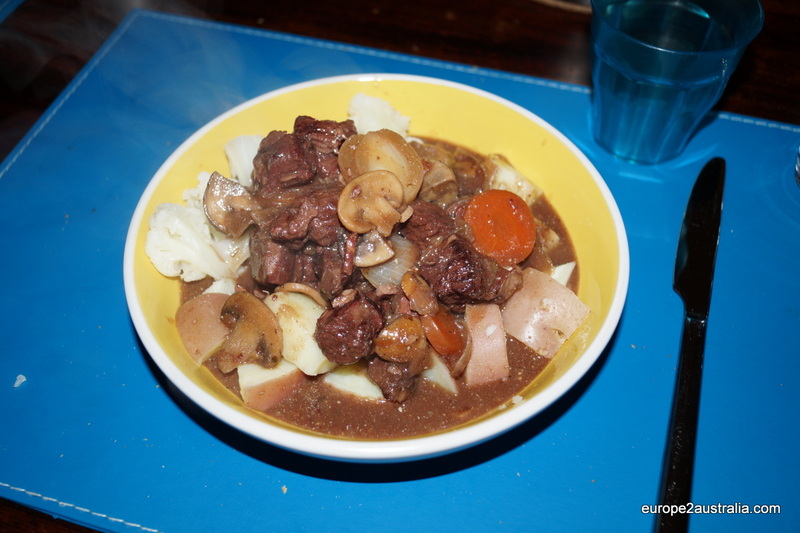 Enjoy with some cauliflower and potatoes. Best with some red wine. 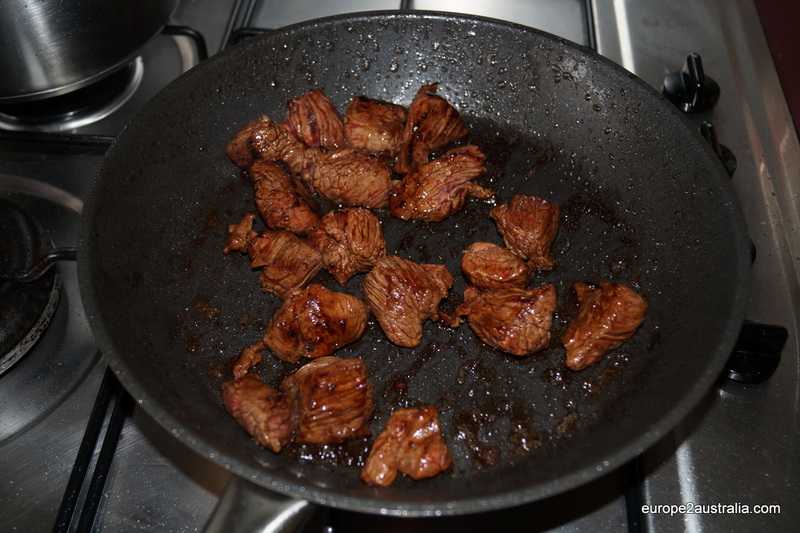 The result was very nice, even though the taste was not too different from some good beef. There is a bit of a gamey taste to it, but nothing as distinctive as lamb, for example. So, definately an exercise to be repeated. Het klinkt heel goed en lijkt me zeer smakelijk 🍴😋. Hebben jullie de Anzac-koekjes al geprobeerd? Yes. But they are fairly tough cookies, and not really a favourite.